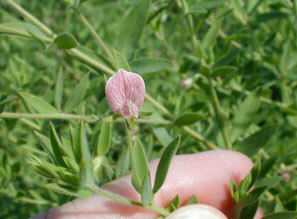 Also Called: American bird's-foot trefoil, pursh's deer-vetch. Stems: Erect, much branched, silky pubescent when young, glabrous when older. Leaves: Alternate, nearly sessile, 3-foliolate; leaflets lanceolate or ovate-lanceolate, 2/5 to 1 inch long, silky-pubescent; tips pointed. Inflorescences: 1-2 flowers on stalks in upper leaf axils; subtended by single leaf-like bract. Flowers: Calyx tubular-bell-shaped, soft hairy; teeth narrowly lanceolate, unequal; corolla papilionaceous, 1/5 to 1/3 inch long, pink with darker veins, white with pink veins, or rarely cream-colored; banner egg-shaped, 1/4 to 1/3 inch long; wings and keel less than 1/4 inch long; keel tip yellowish; stamens 10, 9 united, 1 free. Fruits: Pod, spreading or bent downward, straight, narrowly oblong, .8 to 1.6 inches long, circular in cross-section, glabrous; seeds many, tiny, olive to light brown, often mottled, somewhat shiny. Habitat: Prairie plains, rocky hillsides, stream valleys, roadsides, dunes waste areas; open, sandy soils. Distribution: Central 1/3 and southeast corner. Forage Value: Livestock will eat the immature plant. Uses: Quail consume the seeds.